Safe Place Youth Emergency Shelter Grand Reopening! 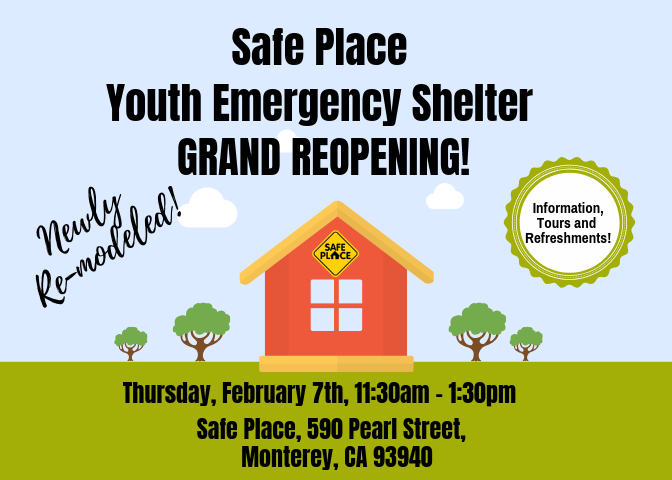 Please join us, Thursday, February 7th from 11:30am-1:30pm for a GRAND RE-OPENING of our runaway and homeless youth emergency shelter at Safe Place. Tours, refreshments and information will be provided. Learn about the life saving work we’re doing to help vulnerable youth in our community. Hope to see you there! 590 Pearl St., Monterey, CA 93940. Safe Place is a comprehensive program providing runaway and homeless youth with food, clothing, temporary shelter, a 24-hour helpline, street outreach, crisis resolution counseling, family reunification or alternate placement, education about sexual safety and violence, substance abuse education, information and referrals and aftercare. For 50 years, Community Human Services has provided professional, affordable mental health, substance abuse counseling and homeless services to the residents of Monterey County. These services focus on the entire family and include programs for people of all ages. If you would like more information about Community Human Services, or want to schedule an interview with staff or clients, please call Communications Coordinator Lenina Sanchez at 831.658.3811 or email lsanchez@chservices.org. © 2017 Community Human Services All rights reserved. Developed by Coastline Marketing Group.